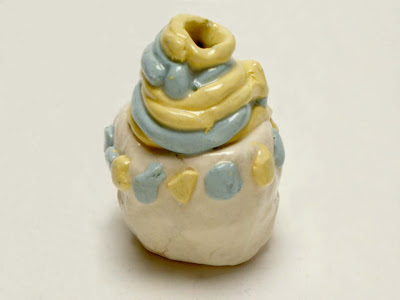 The children make pinch pots and decorate them with colored clay using one of two methods: adding it to the already pinched pots as shown above; or adding it to the balls of clay before the pots are pinched as shown in the second photo. For ages 6 to 9. Plan 1 session. Note: Amaco’s Versa Clay No. 20 fires white and has good plasticity, making it easier for children to use. In order to control the clay while pinching their pots, the balls of clay must be sized to fit comfortably into the palms of the children’s hands—they will be surprisingly small. The clay should be slightly wetter than usual to prevent cracks from forming as the clay is stretched. Decorations can then be added without having to scratch and slip the clay. 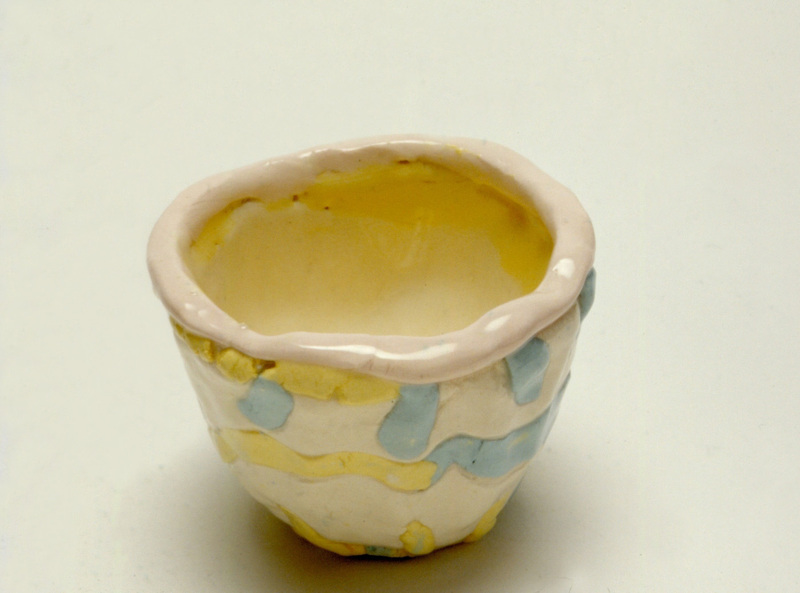 Two methods of decorating pottery with colored clay are presented in this lesson. 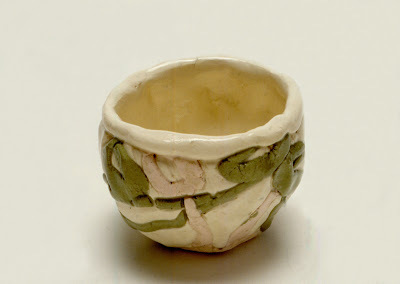 In both, coils and shapes are made with the colored clay, but in one they are attached after the pot has been pinched, as seen in the first photo above, and in the other, they are attached to the ball of clay before the pot is pinched, as seen in the second photo. In the latter method, the colored clay is melded into the surface of the pot, resulting in a more organic design. The first method is good for all ages, but the older children enjoy the challenge and surprises of the second method. Set out balls of clay for making the pinch pots, planning one for each child plus extra. Making the colored clay is a trial and error process because of the variation in the consistency of clay and the intensity of color in underglazes. 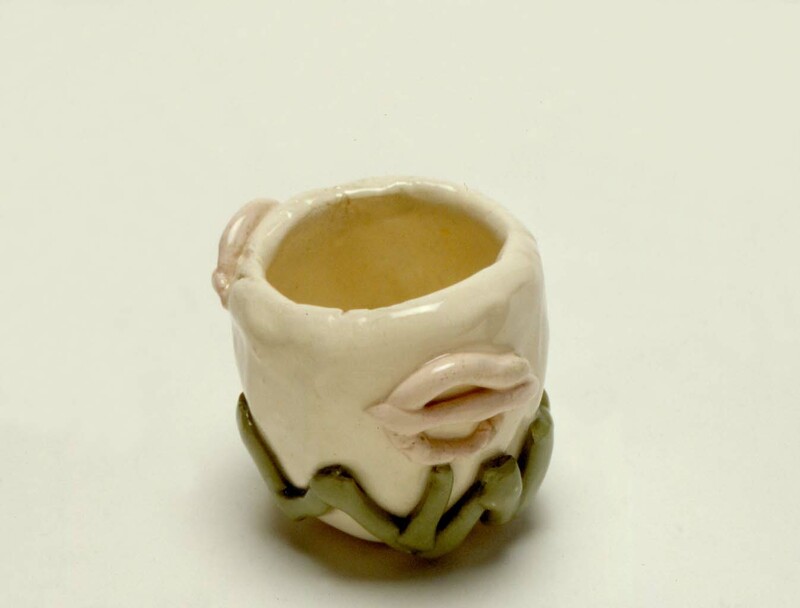 To start, make a pocket in a large chunk of clay and fill it with underglaze. Then close up the pocket and blend the clay carefully, kneading it until the color is evenly distributed. This is a messy process and the clay will be very wet. Leave it unwrapped to air-dry until it returns to a workable consistency. Since the clay does not turn white until it is fired in a kiln, the depth of color will not be immediately apparent. You will need to test fire a sample of each color in a kiln to be sure enough underglaze has been added—the darker colors of underglaze usually result in stronger colors. Make three or four colors of clay and then roll them into one-inch-sized balls. Set out the balls on trays that are clearly labeled with each color. Plan two balls of colored clay for each child plus extra. Have available a needle tool or sharpened pencil. Have trays and plastic ready for drying pots. Explain to the children that they will be pinching clay to make pinch pots and then decorating them with colored clay. Tell the children that the colors have been added to the clay, and after the clay is fired in the kiln, the pots will be white and the colored clay used for decorating will be the same as the ones labeled on each tray. 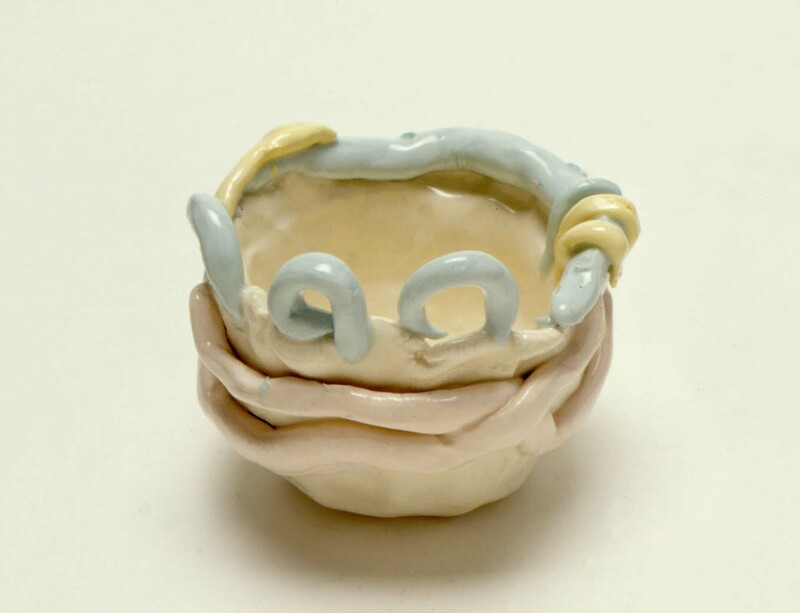 Demonstrate how to make a pinch pot by rolling a ball of clay between your palms to make it round. Explain that one hand (usually the less dominant one) will hold the clay, while the dominate hand does the pinching. Place the ball of clay on the less dominate hand opened flat so that the fingers will not be in the way while pinching the clay. Using only the thumb of the other hand, press it into the center of the ball until it is about one-half inch from the bottom. Emphasize that only the thumb will go inside the pot. Pull out your thumb and show the children the hole made in the pot. Make the hole larger by pinching its sides. With your hand in the air, show the children how to pinch with the fleshy parts of their fingers and thumbs rather than the tips, which will cause the clay to break off. Place your thumb all the way to the bottom of the hole and, with two fingers on the outside, pinch gently. Rotate the pot about one-quarter-inch after each pinch. Working slowly and concentrating on the feel of the clay, continue this movement of pinch and turn, pinch and turn, all the way to the original starting point on the ball of clay. Show the children how the hole has grown. Repeat the pinching process slowly to avoid stretching the clay too quickly. Emphasize that once a pinch is made in the clay, it must be repeated all the way around to the starting point to maintain the pot's roundness. Demonstrate how to roll a coil of clay by breaking off a small chunk of clay and rolling it between your hands to form a snake-like shape. Put the “snake” on a flat surface. Starting with your fingertips, roll the clay down to the bottom of the palm of your hand and back to your fingertips. Repeat this motion moving up and down the coil, gradually increasing pressure until the coil is about one-quarter-inch in diameter. Explain that the lip, or top edge, of the pot is important to give the pot a finished look. This can be done by smoothing the edge or attaching a final coil to the top. 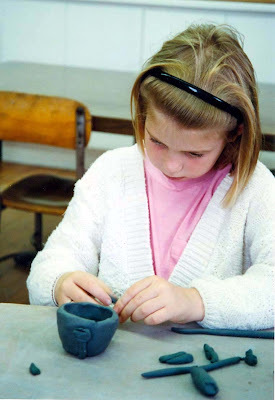 Discuss ways that the children might use the colored clay to decorate their pots, such as handles, lips, designs added to the sides of the pots, or making the pots grow taller. Have the children pinch their pots; choose two colors of clay; and then decorate their pots. Decorating the pinch pot with colored clay. Explain that by decorating the ball of clay before the pot is pinched, the colored clay melds into the surface of the pots, giving them a more organic, or natural, appearance. Have each child choose two colors of clay to use for decoration; press coils and shapes made with the colored clay onto the surface of the clay balls; and then pinch the pots. Decorating the ball of clay before pinching the pot. Note: Dry the pots slowly on trays, loosely covered with plastic, and then bisque-fire them in a kiln. Apply a coat of clear glaze and let them dry again before glaze-firing them. Children often want to paint their coils with different colors, but painting individual coils is tedious and difficult. While looking for an easier way to have multicolored coils, I became intrigued with the idea of colored clay. 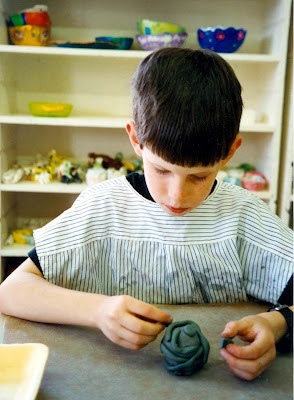 Unless the children are experienced with working with clay, it would be too confusing to offer both methods at the same time. It is better to offer each method in a separate session. Mixing underglazes into the clay will be very messy. You will need to wash your hands and clean the work surface often to keep the colors from becoming muddy. Plan to make only enough colored clay for the decorations. Since the children will hold the clay in their hands while pinching the pots, it is not necessary to cover the work surface. Coils can be rolled on a hard surface without sticking. Handling the colored clay sometimes leaves finger marks on the insides of the pots that will become apparent only after the pots are fired in the kiln. Avoid these marks by brushing a layer of clay slip on the insides of the pots while they are leather-hard. Discuss the variety of ways that the colored clay was used. Compare the differences between working with colored clay and painting with underglazes. This clay looks gray not yellow. I got my pieces of colored clay mixed up and now I can’t tell which color is which. Why aren’t we going to paint the colors on our pots? Can I make my pinch pot with the pink clay? Even though all of the clay looks gray now, the different colors that have been added to the clay will show after the pots are fired in the kiln. If you look carefully at your clay, you will see that the shades of gray are different depending on the color of underglaze that was added. Compare the shade of your clay to the clay on the labeled trays to determine what color it will be after being fired in the kiln. Coils are hard to paint individually, so putting the colors directly into the clay makes it easier to have different colors of coils next to each other. The clay we are using to make the pinch pots will be white after it is fired in the kiln. 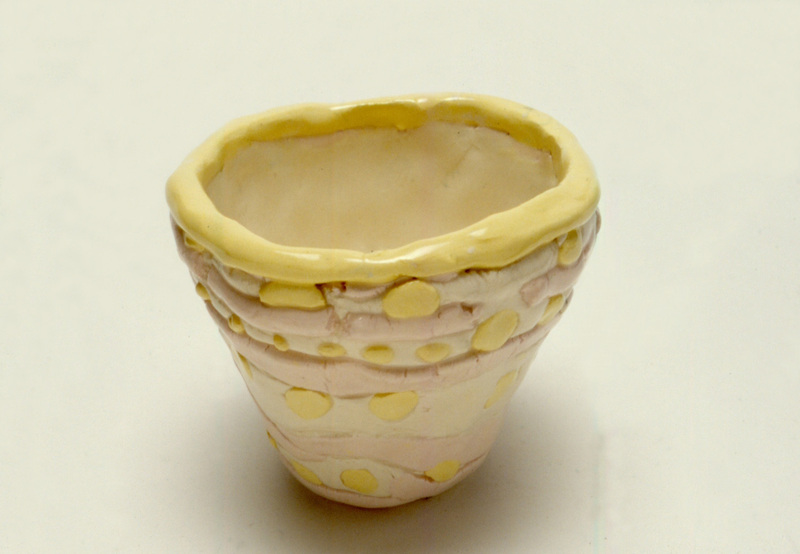 We only have enough colored clay to decorate the pots, but you can add lots of pink designs.